In Hopper Quarterfinals 1 Match 2, we achieved the highest score without penalties in the world, winning with an astonishing total of 270 that included the highest goal count of any match this season with 24 high goals. 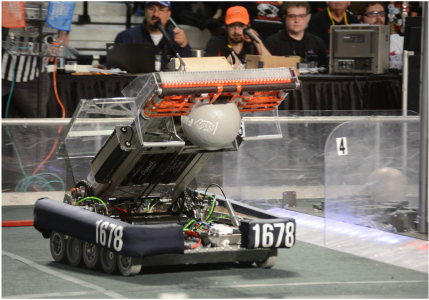 Our success continued onward into the Einstein Field, where a clash against the powerful alliance from the Newton division in quarterfinals left us standing victorious and ready to advance to a highly anticipated semi-final showdown. However, after three grueling matches, we ultimately lost to the current 2016 World Champion alliance of Team 330 The Beach Bots from Hermosa Beach, California, Team 120 Cleveland’s Team from Cleveland, Ohio, Team 2481 Roboteers from Tremont, Illinois, and Team 1086 Blue Cheese from Glen Allen, Virginia. We would like to give a huge thank you to our good friends Team 971 Spartan Robotics and their amazing mentor Austin Schuh for all the support they have given us throughout the season. Austin demonstrated an exceptional act of gracious professionalism when, after his team was eliminated by our alliance, he reached out to help us troubleshoot some problems with our robot during the semi-final elimination matches on Einstein Field. 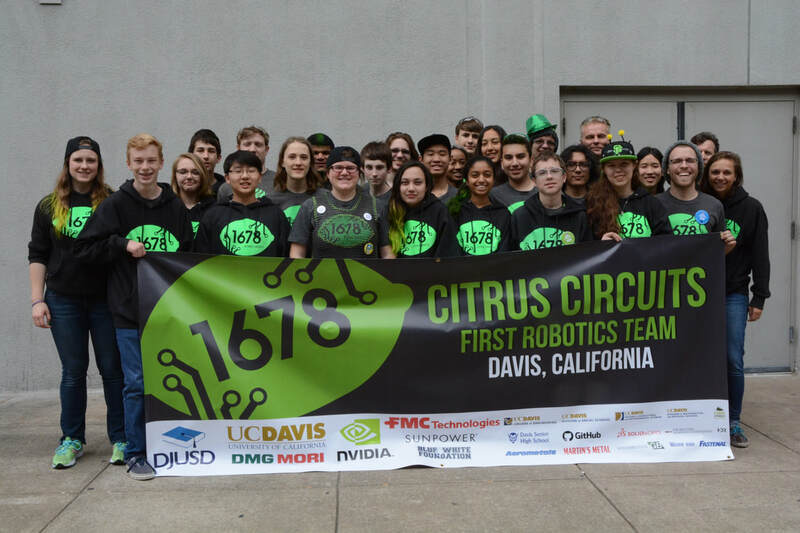 The end of the 2016 season brought tremendous glory for Team 1678 Citrus Circuits! This is the fourth consecutive year we made it to the Einstein Field as the first seeded alliance captain or first pick, a feat that we are the first to accomplish. Our team competed in the Hopper sub-division, ranking third after qualifications with the highest autonomous score in the entire division. 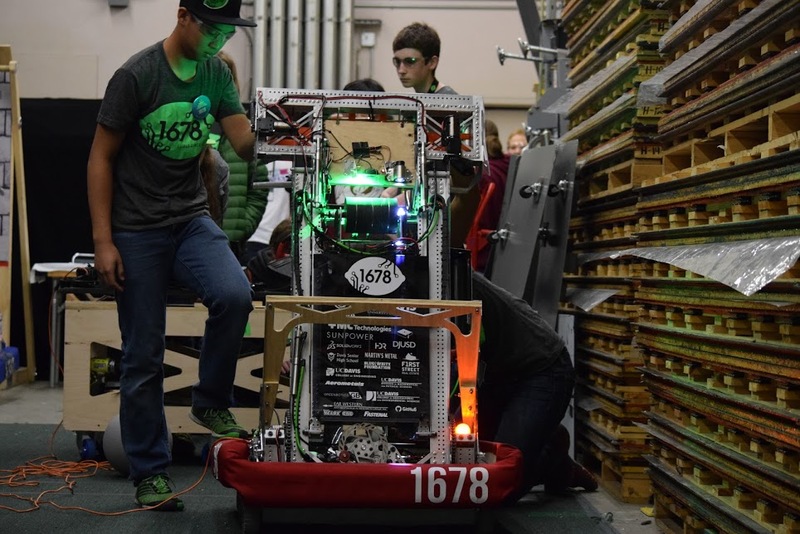 We unleashed our two ball autonomous routine for the first time in competition, which helped us edge out 971 for our third place ranking in the Hopper division. During alliance selections, we were picked by Team 148 Robowranglers, from Greenville, Texas, along with 364 Team Fusion from Gulfport, Mississippi, and Team 2990 Hotwire from Aumsville, Oregon (who would become the first Pacific Northwest team to play on the Einstein Field). Together, we wrangled the competition and overthrew Team 971 Spartan Robotics in an exhilarating series of final matches. Thanks to all the teams we played against for a great season, and congratulations to the new 2016 World Champions! This has been one of the most incredible games so far, and we look forward to another extraordinary season in the FIRST Robotics Competition. Our team won its third blue banner at the Silicon Valley Regional in San Jose, where we faced intense competition from some of the best teams from California, along with teams from Hawaii, Turkey, and China. After highly competitive qualification matches, we seeded first among the 66 teams at the competition. This allowed us to choose our alliance partners for the playoff matches: Team 254 Cheesy Poofs from San Jose and Team 1662 Raptor Force Engineering from Lodi. Together, we were undefeated in the elimination round and had the highest score of the competition with 212 points. Our team earned its second blue banner of the season at the Sacramento Regional in the UC Davis Pavilion on March 23 to 26, with twelve wins, one loss, and one tie. Qualification matches were a bit of a struggle, with some mechanical malfunctions leading us to our only loss of the competition. We were seeded fourth at the end of qualifications and were the first pick by Team 971 Spartan Robotics from Mountain View. Rounding out the alliance was Team 5274 Wolverines from Sacramento. 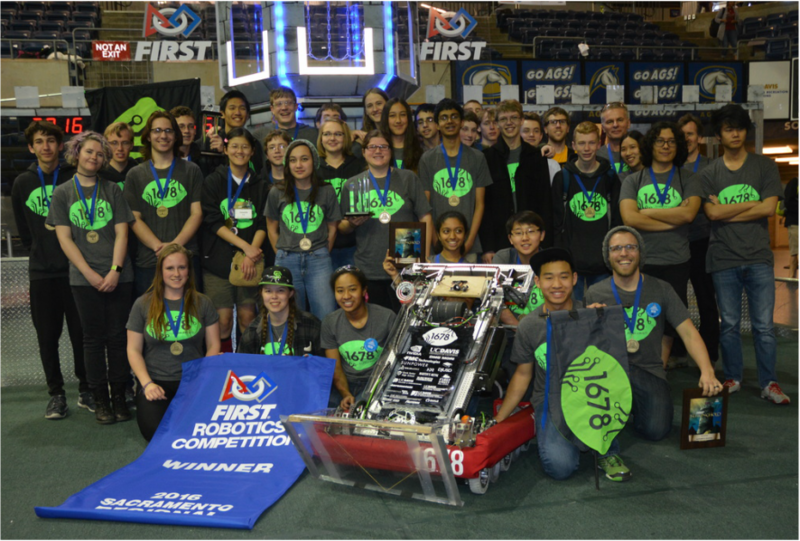 Together, the alliance went undefeated in elimination rounds and dominated in the final rounds, setting a high score of 205 (with no penalties) on the way to becoming 2016 Sacramento Regional Winners. Along with the blue banner, we also won the Excellence in Engineering Award, sponsored by Delphi, which celebrates an elegant and advantageous machine feature. Michael Corsetto, our head technical mentor and drive coach, was recognized with the prestigious Woodie Flowers Finalist Award, an award that is presented to a mentor that bests demonstrates leads, inspires, teaches, and empowers their team using excellent communication skills. His nomination essay, written by Megan Yamoah, can be read here. Out of the 60 teams at the competition, we scored about 4.75 shots per match, and had a 77.5% accuracy rate, an even better shooting performance than our last competition. We also had an accurate one ball autonomous routine, which had the second highest shot accuracy at the regional. Photo of Woodie Flowers Finalist Mike Corsetto and his wife, Pearl. 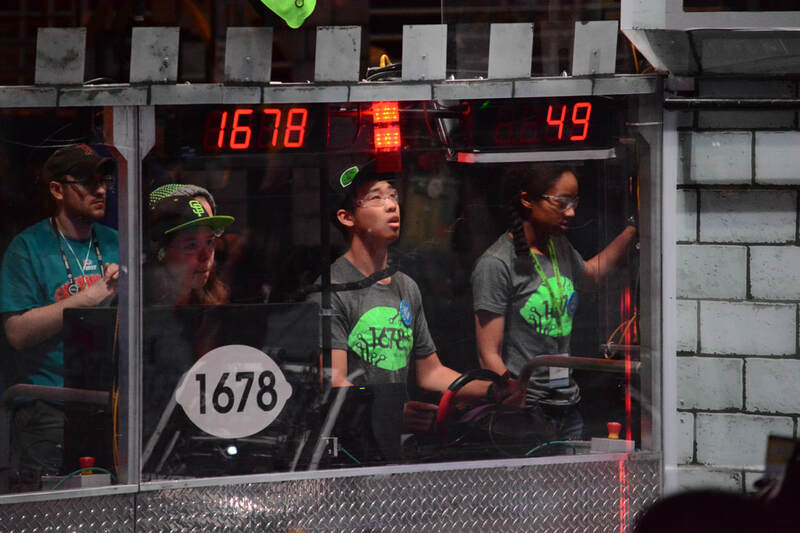 At the Central Valley Regional Competition in Madera, our team competed with 48 other teams from California in this year’s FIRST Robotics Competition (FRC) game, Stronghold. We claimed first place in the start of the competition and firmly held onto that ranking, seeding first after qualification matches. This allowed us to choose our alliance partners: Team 254 Cheesy Poofs from San Jose, and Team 3970 Duncan Dynamics from Fresno. ​Together, we scored a total of 380 points in the final two matches, earning them the title of Regional Winners. We also set the highest competition score in the world this season with 210 points in the quarter finals. In addition we had the highest shot accuracy of 68% during tele-op and scaled or challenged in 9 of our 10 qualification matches. Along with our on-field victory, we also won the Quality Award. 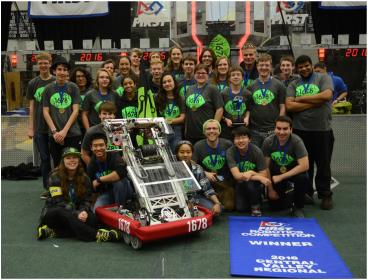 Sponsored by Motorola Solutions Foundation, this award recognizes outstanding robot design and construction.